We love Homemade Valentine’s Day Treats. Especially once shaped as Conversation Hearts! Sarah from Maison Cupcake knows her baking! My first meeting with her will always remind me of a delicious flapjack that she handed to me instead of business card. Yum. Certainly a way to get to my heart and be remembered! 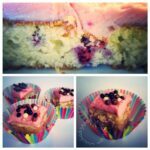 On her fabulous blog, Maison Cupcake, you will find fabulously foody posts, just reading them makes my mouth water and makes me want to run off and bake and cook. So if food is your thing, hop over! If food is NOT your thing.. hop over anyway, Sarah is lovely! 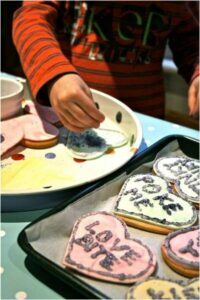 Today, Sarah shares with us this fabulously fun “Love Heart Cookies”? 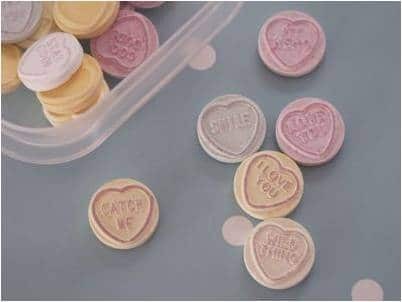 Remember Love Hearts (“conversation hearts”)?! Oh yes, well there is nothing better than a Love Heart Cookie to share around with the loved ones in your family. 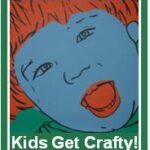 Even better, children can help! It’s such an honour to be doing my first ever guest post at Red Ted Art! I first discovered Maggy’s blog when I was visiting people on the blog roll before Cybermummy, the UK’s first mummy blogging conference. Red Ted Art jumped out at me on the list because my son is called Ted and when I saw how lively the blog was I made a definite note to make sure I met Maggy at the conference. Happily we were seated at the same table and had plenty of opportunity to chat about our teds and blogs alike! 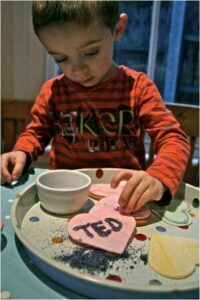 My son adores making and decorating biscuits and this recipe is especially suitable for doing with young children as you can break it down into stages and do ten minutes here and there when you have time. I keep all the ingredients on a big tray on the worktop and get it out for ten minutes before or after dinner to move onto the next stage. Provided you keep your icing covered and work fairly quickly with the fondant stage, you can take your time making these over a couple of days. The biscuit dough recipe yields a generous amount so I usually split the batch in half and freeze some for another occasion. This dough had been in the freezer since Hallowe’en and worked perfectly well. I use rolled fondant to cover these cookies because it is quicker and easier and gives virtually the same effect. 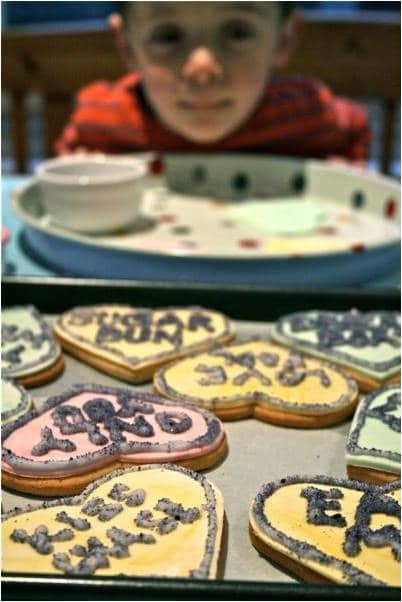 You can alternatively fill and flood your cookies with royal icing before allowing them to set and piping on the words. It’s also up to you whether you pipe messages on the fondant before or after you adhere them to the cookies. If you’ve got lots more fondant hearts than cookies and are unsure about your piping skills then maybe you’d prefer to pipe onto fondant before sticking the hearts down so you can choose which ones have worked best. If you choose this method you’ll need to do it all in one session as the fondant will dry out not cling to the surface of the cookie as well. Alternatively, you can use a fish slice to slide the damp iced fondant heart onto the cookie but you will risk damaging it and it won’t be stuck down fast for when you tap off the sugar. Whichever method you use therefore involves the odd hairy moment but if you take your time you should be fine. I prefer to stick your fondant hearts to the cookies in advance so you can wait until the next day to do the piping and sugaring. The recipe below describes doing it the slow laid back order rather than fly by seat of pants hurry hurry way. Love Hearts or “conversation hearts” as they are known in the US have been popular children’s sweets for decades. I was amused to hear on the radio once that someone in their factory has the job of dreaming up phrases that will appear on the sweets. I guess they have to come from somewhere! It makes me laugh how the phrases have been updated over the years to reflect flirting with the use of modern technology. The packet I bought as research featured the message “Page Me” which inspired me to do a Facebook style cookie saying “Poke Me”. I’ll let you interpret that how you like! 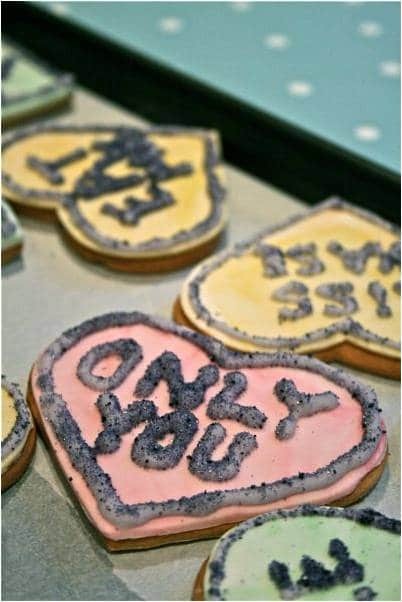 Depending who you are giving your cookies too, your love messages can be as demure or as cheeky as you like! I’m currently deciding whether I can get away with sending a batch including the words “Love Bite” to my son’s preschool or husband’s office. Oh well, I’ll have to eat that one myself. 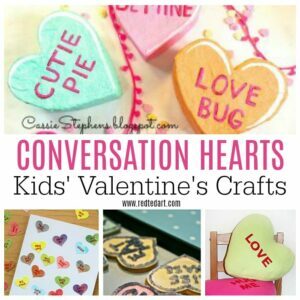 What would you write on a Love Heart cookie? 1. To make the cookies, first cream the butter and sugar together until pale, then beat in the eggs and vanilla. In another bowl combine the flour, baking powder and salt. Add the dry ingredients to the creamed mixture and mix gently. Be wary of adding too much flour at this stage as you will add more when you roll the biscuits out and you don’t want it to be too dry. 2. Halve the dough and form fat discs. Wrap with cling film and refrigerate for at least one hour. The dough freezes very well for 3-4 months if you want to save half for another occasion. The batch I used here was left over from Hallowe’en. 3. Whilst the dough is in the fridge, preheat the oven to 180C/160C fan oven/Gas Mark 4. 4. Sprinkle your work surface with flour, place a disc of dough on it, and sprinkle a little more on top. Roll out to a thickness of about 1/2 cm. Cut out your heart shapes and space well apart on the baking sheets. around the edges. Cool on a rack and continue with the rest of the dough. Your oven may be slightly different so use this time as a guide. 7. 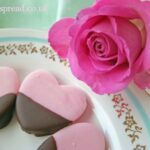 Using icing sugar to stop it sticking to the table and rolling pin, roll out your tinted fondant and cut out heart shapes with the cutter. Take care not to stretch the hearts or they will be bigger than the cookies. 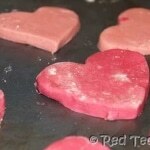 Lay the hearts out on baking parchment paper. 8. 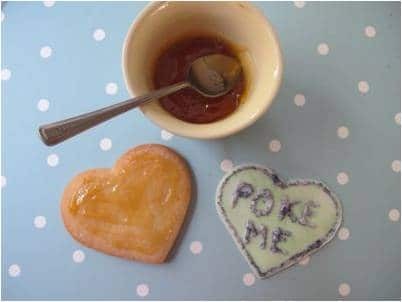 To adhere the fondant hearts to the cookies, warm your apricot glaze slightly. I give mine a 15 second blast in a ramekin in the microwave rather than dirtying saucepans. If you have a pastry brush use it to paint the jammy glaze on the top surface of the cookies. Alternatively, rubbing it on with the back of a teaspoon will suffice. Carefully press down a fondant heart to each cookie. Your fondant hearts should be roughly the same size as your cookies. 9. If you need to make your own royal icing, put the egg white in a large bowl and whisk lightly until a foam forms. Add around a quarter of the icing sugar and the lemon juice and beat in well with a spoon. 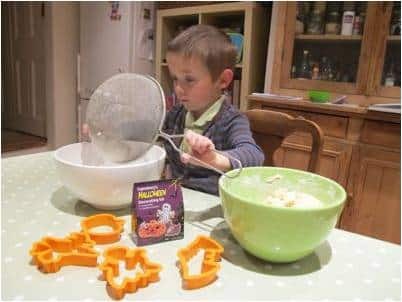 I prefer to do this in the food processor using the egg whisk attachment as it avoids getting icing sugar everywhere but you can either do by hand or with an electric hand mixer. Keep adding a quarter of the sugar at a time until you have a consistency that is both smooth and firm enough for piping. Royal icing will keep in a tub for a week. 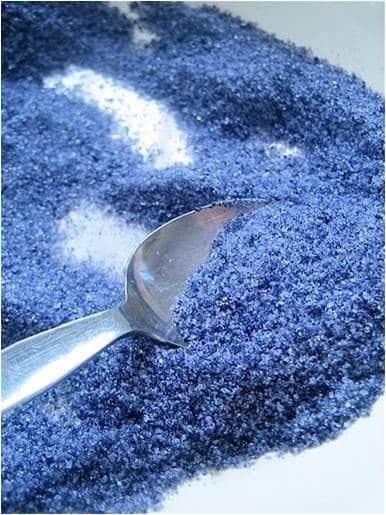 You can use meringue powder as an alternative to raw egg whites. 10. Tint the royal icing with some violet gel colouring on a cocktail stick. You are aiming for very pale violet. Use a spoon to half fill a disposable piping bag fitted with a straight writing nozzle. 11. Pipe a line of royal icing around the edge of each heart so that you leave 1mm showing around the edge. Pipe your messages onto the cookies. Aim for pairs of words with a maximum of 4-5 letters. 12. 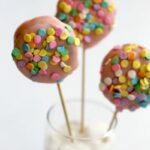 Gently tip a spoonful of coloured sugar over the wet icing, shake the cookie to spread it about then tap firmly on the edge so that the excess falls off. Repeat if necessary. Continue with each cookie until all covered and allow icing to harden. 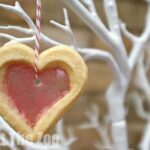 Your Love Heart Cookies are FINISHED!!! So.. What would you write on YOUR cookie? Thank you so much for letting me guest on Red Ted Art. Kids love making biscuits so this was an idea thing for me to write a post about for you. I can go and eat some of them now! Thank YOU Sarah, you put SO MUCH EFFORT into this really fab post.. and.. come on now, pass a cookie over, I WANT ONE! These are so cute! They look great. Can you tell me the make of the gels you used? Were they Squires? I always remember getting these when I was a child. I didn’t realise they’d updated the messages. What a great job to have dreaming up the words. @deerbaby I used Wiltons gel colouring which comes in packs of 8 little pots from Lakeland. It costs about £18-20 for 8 colours but when you consider you’d pay nearly a pound each for ones from the supermarket which don’t work properly they’re good value. They last for ages as you only need a tiny tiny bit for most things – achieving bright red or black will guzzle more of it though!! Oops meant to say, Lakeland don’t appear to be selling it on their site at the moment but Amazon have got some. This is a great idea! 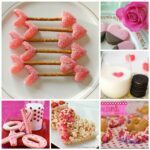 I hope you will link to the Virtual Valentine’s Day Party on my site. It starts next Sunday. What a nice activity to do with children and Teddy looks to be having a grand time of it. Thanks for the fondant idea too, looks much easier than royal icing. Bum.Made something similar today but with shortbread but I used a letter press for the words.Thought I was being original.I was going to put it up Monday on my blog but it’ll look like I was copying now.Very good job! Hi! I came over from Homemaker Monday. These are so cute! I’ve never worked with fondant before. These cookies would be perfect to take to my son’s Valentine’s Day party. These are so cute I can’t wait to try them. This looks lovely. I might have to try this with my kids. I am not sure if my 2 year old is quite ready for this kind of biscuit yet but I can’t wait till he is. LOVE the hearts. Maybe I’ll help him ice some for Daddy for Valentine’s Day! These are too cute! Great tutorial! Done, thanks for the invite! I had one of Sarah’s flapjacks too, they were delicious! I love these, so original and I love that you can do these in stages which definitely suits our busy household. Oooh I’m making these for Valentine’s Day! These look AMAZING! How great for Valentines Day too. Thanks for sharing this. I am in awe. Love the read stuff like this, amazing and creative. fabulous. Thanks for linking up to the It’s a Keeper Thursday blog hop! I hope you come back this Thursday and link something new! I invite you to add this post (or any other Valentine\’s Day posts) the Find Some Love Fest on February 1st! 5 blogs, 1 party! 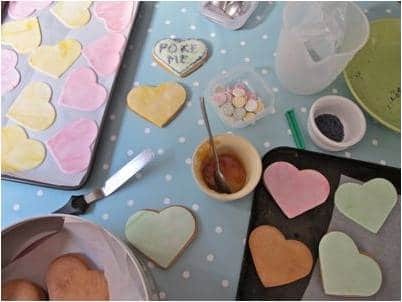 I have just read Sarah\’s post on her wonderful giant dinosaur cookie and now am even more taken by these gorgeous pastel coloured love heart cookies. 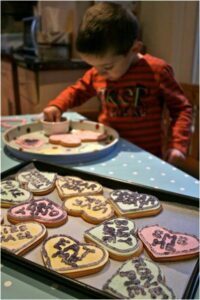 I am thinking of Valentine\’s ideas myself as it falls during half term week so will be making some little cookies of the Romantic persuasion…..lots of red, pink and white food colouring shall get used as well as glitter/glimmer/sprinkles!